Click on the links to go to the recommended websites. Explore the Earth’s structure with a clickable diagram. See lots of animals that live underground. Play a game and explore a termite mound. Lots of fossil things to make and do. Find out more about archaeology and digging up the past. A fantastic flap book that takes children on a journey to the centre of the Earth. 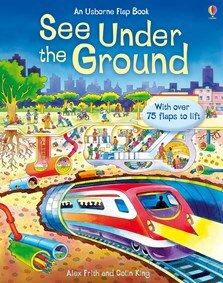 Beginning with the Earth’s core and crust, this innovative book also shows creepy caves, amazing underground animals, the bustling world below city streets and more. Featuring bright and colourful illustrations and simple, informative text and picture labels. With over 75 embedded flaps to lift. This is a fantastic, interactive, fact-filled book from the Usborne 'See inside' range. The pages are packed full of wonderfully detailed colour illustrations and diagrams, complete with picture labels, to reinforce learning. The best feature of the book is the amazing number of embedded flaps found on each page, which your child will have great fun opening to reveal further facts and pictures hidden inside! One in a great range of factual books, with simple text, fantastic attention to detail and much to see and explore on each page... educational, informative and great fun!